The bodies of a number of US sailors who were missing after their warship collided with a container vessel have been found in the destroyer's flooded compartments. The USS Fitzgerald suffered major damage in the crash with the much larger Philippine-flagged merchant ship off the coast of Japan on Saturday. 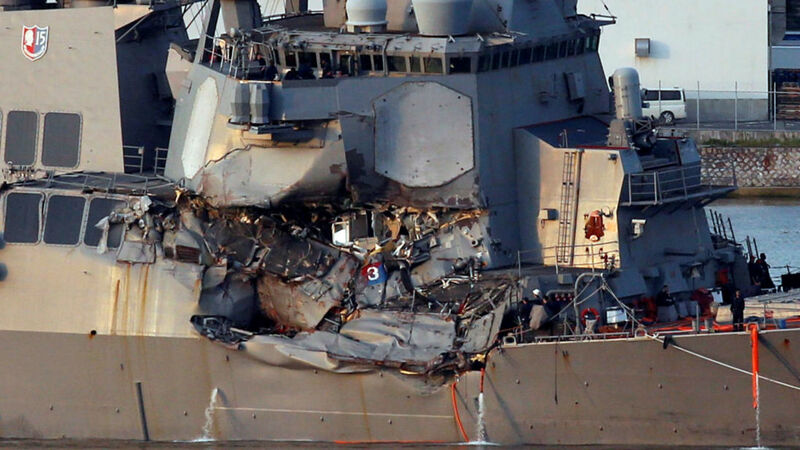 Seven sailors were listed as missing following the collision, but it is unclear if all had been found by navy divers. The US Navy has declined to say how many had been recovered. The bodies were being transferred to a US naval hospital where they will be identified. Japanese media said all seven sailors were found dead. The US 7th Fleet said in a statement: "As search and rescue crews gained access to the spaces that were damaged during the collision this morning, the missing sailors were located in the flooded berthing compartments. "They are currently being transferred to Naval Hospital Yokosuka where they will be identified. "The families are being notified and being provided the support they need during this difficult time. "The names of the sailors will be released after all notifications are made." The crash happened at 2.30am Saturday local time, around 56 miles southwest of the city of Yokosuka, which is home to a US naval base.